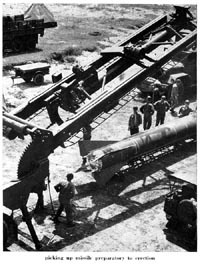 In October 1953, the first unit equipped with atomic artillery arrived in the command and on 23 October 1953 atomic field pieces were exhibited at Mainz (Ordnance Depot) before the French, German and American press. By June 1954, three additional units with a total of at least 8 atomic weapons of 280-mm caliber had arrived. They were used in fall and spring maneuvers in order to give troops practice in simulated atomic attack and defense action. The atomic artillery was also used as regular heavy artillery, firing conventional ammunition. 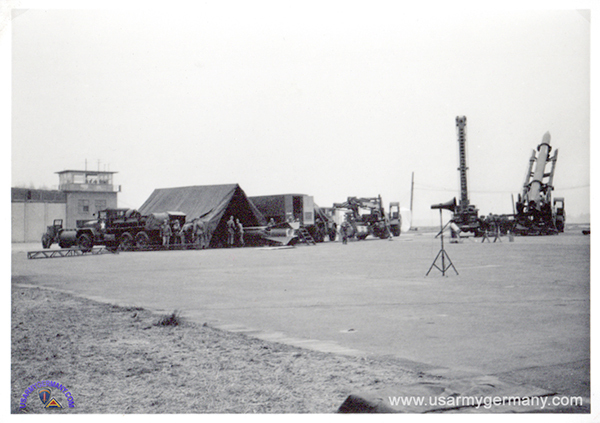 The most significant change affecting Seventh Army's organization during FY 1955 was the addition of six field artillery rocket batteries, one 280-mm gun battalion (216th FA Bn (280mm Gun), and a guided missile battalion (259th FA Msl Bn (Cpl). These units, each capable of delivering either atomic or conventional warheads, substantially increased Seventh Army's combat capability. Seventh Army assigned three "Honest John" rocket batteries to each corps to strengthen the corps artillery. The "Corporal" guided missile battalion was assigned to Seventh Army artillery. 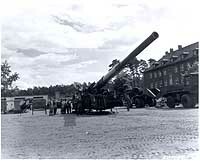 The 280-mm gun battalion that reached Europe during FY 1955 was the sixth unit of that type to be assigned to Seventh Army. During the spring of 1955, Seventh Army assigned one battalion to each corps, the other four 280-mm battalions remained attached to the 42nd Field Artillery Group, which was assigned to Seventh Army artillery. 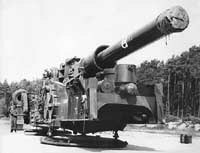 The 280-mm gun battalion that reached Europe during FY 1955 was the sixth unit of that type to be assigned to Seventh Army. (2) During the spring of 1955, Seventh Army assigned one battalion to each corps, the other four 280-mm battalions remained attached to the 42nd Field Artillery Group, which was assigned to Seventh Army artillery. 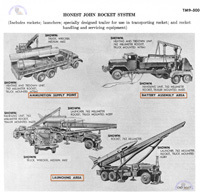 The "Honest John" rocket batteries that arrived in command during the fiscal year were located at Kitzingen, Ansbach, Schwäbisch Gmünd, Darmstadt, Hanau and Leipheim. 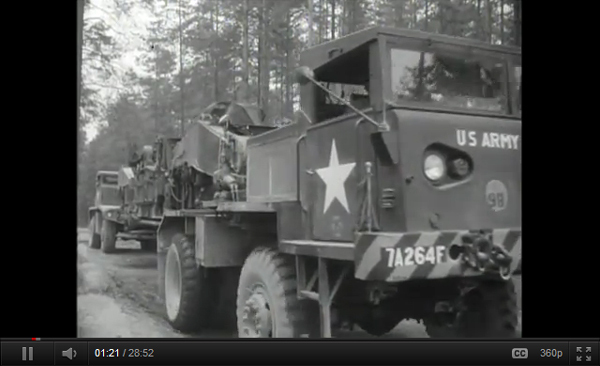 (1) In January 1955, the 259th FA Msl Bn (Corporal) was deployed to Europe with full Type I CORPORAL field equipment. It was accompanied by an Ordnance support company. As the Calendar Year 1955 ended, the Army was preparing to send several Type II CORPORAL battalions to Europe to replace the 259th Field Artillery Missile Battalion, which was still equipped with the Type I CORPORAL. In 1956, the 259th CORPORAL Battalion was replaced in Europe by units equipped with CORPORAL Type II systems. In total, eight Corporal battalions were activated for overseas assignments in Germany and Italy (1955-56). 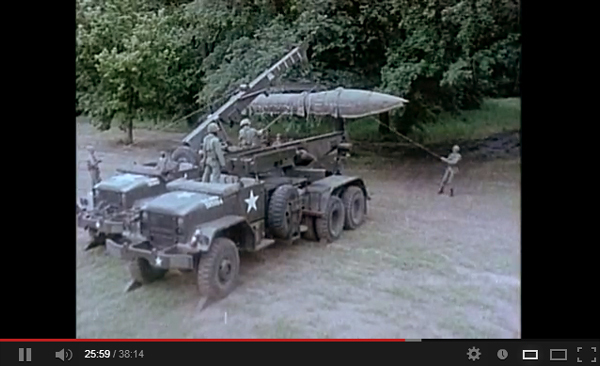 Most Corporal battalions were deactivated in 1963 to be replaced by the SERGEANT missile. I would like to correct the part in "Changes Seventh Army Artillery" section. The 1954/1955 section states the 216th gyroed from Fort Bliss OK. It was Fort Sill OK. I was a radio operator in Battery B of the 216th that went to Darmstadt on that move. 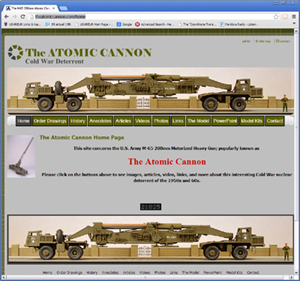 I really enjoyed the history of the atomic cannon that you compiled. New tables of organization for the infantry and armored divisions were published in 1948. Under these TOE's, the artillery of the infantry and arnored divisison were basically identical except that the howitzers in the infantry divisions were "towed" and those of the armored division were "self-propelled." 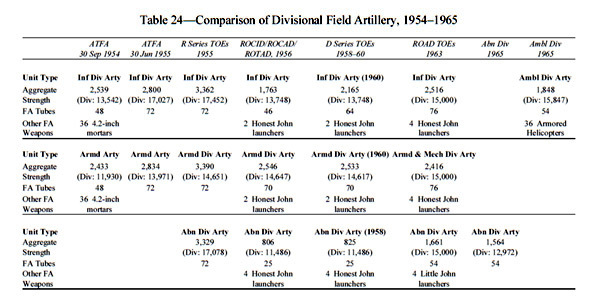 Both 1948 TOEs (TOE 7 for the infantry division and TOE 17 for the armored division) resembled the WWII infantry division artillery with the exception that an antiaircraft artillery (AAA) battalion was added and each infantry division artillery firing battery was increased by two howitzers (to a total of six). The number of field pieces in both the armored and infantry divisions was fifty-four 105-mm howitzers and eighteen 155-mm howitzers. Reorganization of the infantry divisions in the Regular Army began in the fall of 1948. In Europe, the 1st Infantry Division in Germany was reorganizaed and authorized at full war strength. 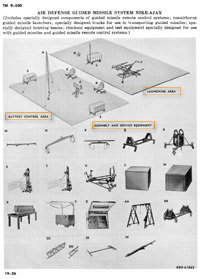 All of the Augmentation divisions sent to Europe in 1951 and 1952 were also organized under these tables when they arrived in Germany. The infantry divisions were equipped with the M101 105-mm truck-towed howitzer in the direct support battalions and the M114 155-mm tractor-towed howitzer in the general support battalion. The following lists show the non-divisional field artillery units assigned to USAREUR in June 1957 and their attachments to the various Army and Corps groups. Please contact me for any corrections, additions, suggestions or comments. a. The USAREUR/NORTHAG Agreement. US EUCOM Operations Plan 100-3 made USAREUR responsible for providing ground-delivered atomic support to non-U.S. NATO nations in Central Europe. The Northern Task Force (NORTAF), composed of two 280-mm gun, two Honest John rocket, and two Corporal missile battalions as well as the necessary logistical support units, had been formed to furnish atomic support to NORTHAG. The new USAREUR/NORTHAG agreement, which had been drafted in February 1958 to replace the US Seventh Army/NORTHAG Agreement then in existence, was not ratified until 15 June 1959. This new agreement covered the movement, operational control, administration, logistical support, and communications of NORTAF. After approval by US CINCEUR/SACEUR, the order for the deployment of this force would be issued by CINCUSAREUR, through the Commanding General US Seventh Army. Two types of movement were planned: The first, designated ADRIAN, was a gradual movement under the guise of training and would take place either during a period of tension or in the early stage of a simple alert. The second, designated CHEVRON, was a rapid movement to be executed when direct deployment to concentration areas or battle positions was required, as upon declaration of ORA or GAO. The time needed to travel from home stations to GAO positions would depend upon the distances involved and the conditions under which the movement was to be executed. Under relatively ideal conditions, times would vary approximately 12 hours for the first unit to arrive in position to 72 hours for the last. When deployed, the units would carry the prescribed load of atomic munitions, which would form part of the NATO allocation of weapons to NORTHAG. Atomic weapons subsequently allocated would be provided through US Advanced Weapons Ammunition Supply Points (US AWASP's) and would remain under physical custody of US forces at all times. 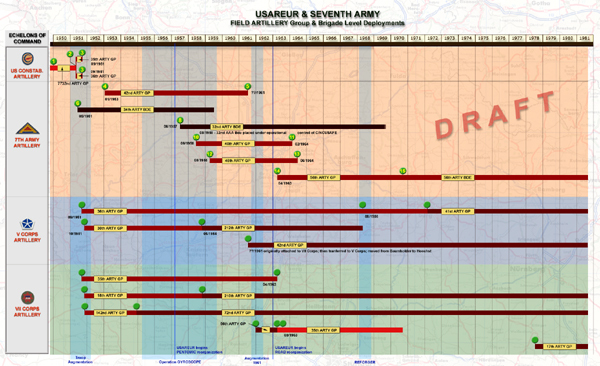 Upon crossing the CENTAG/NORTHAG boundary the task force would be relieved from assignment to the US Seventh Army, assigned to USAREUR (Theater Army), and attached to NORTHAG for operational command. Since the delivery units would normally be employed in army and corps atomic artillery roles, COMNORTHAG probably would further attach them to corps or lower level headquarters, except that he would retain operational control of the Corporal battalions. To preclude any misunderstanding, USAREUR amplified in March 1959 the procedures prescribed for the emergency deployment of NORTAF to the NORTHAG sectors. No atomic warheads under NORTAF control were to precede the delivery units into the NORTHAG area. Warhead supply planning for NORTAF was to conform to these instructions. b. Reduction of Support. On 15 September 1958 USAREUR advised US CINCEUR that the United Kingdom expected to deploy one Corporal unit in the NORTHAG area on or about 1 November 1958. If the British unit attained its operational readiness capability one month later, USAREUR would like to withdraw one of the US Corporal battalions currently commited to support NORTHAG in the event of an emergency. In acceding to USAREUR's request for approval, US CINCEUR specified that operational plans earmarking US delivery units to NORTAF would be revised as NORTHAG's non-US NATO ground atomic delivery capability progressed. In February 1959 General Hodes informed COMNORTHAG that the time appeared to be proper to plan for reducing NORTAF, because a number of non-US NATO atomic delivery units were expected to become operational in his area in the near future. With a British Corporal regiment expected to become operational, one US Corporal battalion might be withdrawn from the commitment to the US task force by 30 June 1959. It also seemed appropriate to plan on phasing out the entire task force commitment by June 1960 in consideratioon of the other non-US atomic delivery units that would become available in the NORTHAG area by that time. In his reply COMNORTHAG mentioned the many problems with which his command was faced in building up atomic delivery units. Although he was urging the five national elements of NORTHAG to have their own organic atomic units, there was still some uncertainty regarding the buildup plan. He suggested, therefore, that CINCUSAREUR postpone his efforts to establish specific dates or plans for a phased reduction of NORTAF. In reality General Hodes did not intend to establish specific dates for the release of each battalion from the NORTAF commitment, but wanted to reach an agreement that US units would be withdrawn from NORTAF on a one-for-one basis as NORTHAG's own atomic delivery units became operational. In any event, the planning assumptions specified in the April 1958 LANDCENT message were for the 1958-59 timeframe and were not valid beyond 1959. On 30 March 1959 General Hodes requested COMLANDCENT's assistance in eliminating the requirement for US atomic delivery support to NORTHAG during 1960. This could be accomplished by three specific kinds of action: First, by announcing unequivocally to the Central Region army groups and defense ministries that USAREUR planned to support only the US Seventh Army with ground atomic delivery units after mid-1960; second, by promulgating 1960-61 planning guidance according to which each member nation of LANDCENT would have to provide its own ground atomic delivery units, and third, by LANDCENT headquarters taking an increasingly active lead in site selection, unit stationing, land acquisition, infrastructure funding, and other aspects of the NATO stockpile program that would fall within its responsibility. NATO organic atomic capability could come about only if the NATO subordinate commands and the national authorities in the Central Region made a concerted, unified effort to bring it into being. 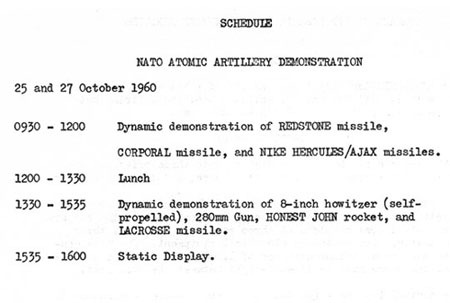 On 5 May 1959 LANDCENT notified the defense ministries of the countries in the Central Region of USAREUR's intentions of withdrawing US Atomic delivery units, and at the same time reminded them of the Allied Command Europe Plan for NATO Atomic Stockpile, dated 12 September 1958, which provided for three Corporal battalions for NORTHAG. LANDCENT also asked SHAPE to leave the Corporal support of NORTHAG at a minimum of three battalions. Upon reexamination of the problem, General Eddleman -- the new CINCUSAREUR -- notified US CINCEUR that his command would provide NORTHAG with the necessary US Corporal support until the Northern Army Group's non-US capability was increased to the equivalent of three Corporal battalions. At the end of the reporting period it was estimated that NORTAF would be phased out within a year except for one US Corporal battalion. The commitment for the last Corporal battalion would continue until FY 1962, when the third NORTHAG Corporal battalion was expected to become operational. 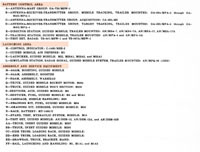 The following lists show the non-divisional artillery units assigned to USAREUR in June 1958 and their new designations under CARS. Please contact me for any corrections, additions, suggestions or comments. (1) I believe that the 3rd Bn, 39th Arty moved from Neckarsulm to Nürnberg before June 1958; did this cause the unit to be relieved from attachment to the 35th Gp? Robert has completed a project that involved finding and contacting many former members of the 594th Field Artillery Battalion, a 155mm SP unit that served in Germany from 1952-1958. 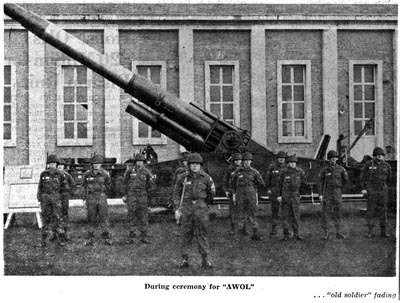 The personal recollections and great photos included in this unit history relate the story of the outfit from its formation at Camp Polk, LA in 1950 as an all-black artillery outfit; its arrival in Mannheim in late 1952 and subsequent move to Rivers Barracks, Giessen; its attachment to the 36th Field Artillery Group; the integration process; and its final inactivation in Germany in 1958. The great efforts of Robert and the other contributors has resulted in a fascinating unit history that should serve as an inspiration for others who want to see their units' accomplishments and their personal experiences recorded and passed on to future generations. 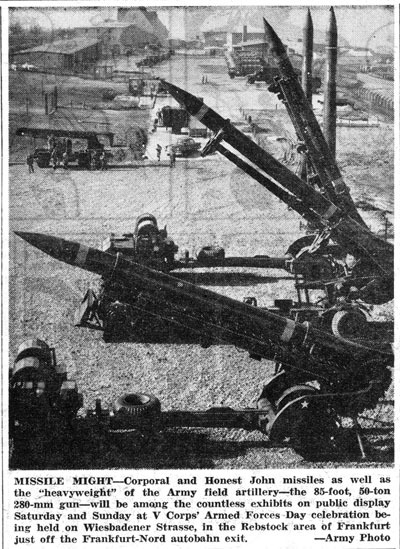 Brochure compiled by the Guest Observer Bureau, on occasion of a demonstration of US Army nuclear-capable field artillery and air defense equipment. 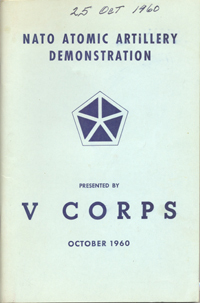 The demonstration was organized by elements of V Corps. 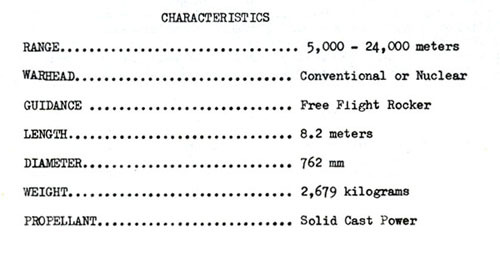 Several of the pages describing organization of nuclear capable units, operational concepts and equipment characteristics are presented in the following sections. The NIKE-HERCULES Battalion consists of a battalion headquarters battery, with 17 officers and 101 enlisted men, and 4 firing batteries containing 8 officers and 133 enlisted men. Each Nike missile battery is divided into three principal areas: The administrative area, the fire control area, and the launching area. The administrative area is composed of the facilities necessary for billeting, feeding, and recreation of the personnel of the battery. The fire control area consists of three radars, a computer, three van-type trailers and necessary electrical equipment. The fire control area must be a minimum distance of 1,000 yards from the launching area, and there must be line-of-sight between the two areas. The control equipment for the radars and computer are housed in three trailers. The Battery Control Trailer contains the computer, the acquisition radar scope and its controls, and a switchboard. From this trailer the Battery Commander directs the acquisition of targets and the firing of the missile. The Radar Control Trailer contains the controls and electronic equipment for the target and missile tracking radars. The third trailer, the Maintenance and Spare Parts Trailer contains the electronic equipment shop equipment and spare components. The first of three radars is the Acquisition Radar which is a search radar. It rotates constantly at a predetermined speed and targets coming within its range are presented pictorially on a radar scope to the Battery Commander at his tactical control position. The Battery Commander, by electronic interrogation, can determine whether target indications appearing on the scope are friendly or hostile. The second radar is the Target Tracking Radar. As targets are acquired by the Acquisition Radar, they are transferred to the Target Tracking Radar which automatically tracks the target in range, direction and elevation, establishing its location. This information is transmitted electrically to the Computer for use in guiding the missile to its destination. The Missile Tracking Radar tracks the missile automaticalyl throughout its flight and continuously sends the location of the missile to the computer. In addition, steering commands received from the computer are transmitted to the missile which directs it toward the predicted intercept point. Continuous commands are sent to the missile to correct for evasive action of the target. When target and missile converge, the missile is detonated and the Missile Tracking Radar automatically transfers to the next missile readied for firing. The third area, which is apart from the Administrative and Control Areas, is the Launching Area. This area is composed of the buildings and items of equipment necessary for assembling, testing, fueling, and firing a NIKE missile. The Missile Assembly and Test Building provides facilities for the uncrating, assembling, and testing of the missiles in the battery. Each missile is given a series of mechanical, hydraulic and electrical checks to assure its proper functioning. Three Launching Sections form the firing components of the battery. Each Launching Section consists of four launcher-loaders from which missiles are fired, a missile storage building, and a personnel shelter which protects personnel during firing and houses electronic equipment. The Nike utilizes a command guidance type of control. The target is initially picked up by the acquisition radar. From the information provided by the acquisition radar, the target-tracking radar acquires the designated target and tracks it throughout the engagement. Another radar, the missile-tracking radar, locks on the missile prior to firing and tracks that missile throughout the entire flight. The two tracking radars feed target and missile. Using this information, the computer continuously determines a predicted point of interception and issues those steering orders necessary to guide the missile continuously toward the predicted point of interception. At that time which will result in the highest kill probability, the computer issues a burst order to the missile. This order detonates the three missile warheads simultaneously. Orders are transmitted by the computer to the missile through the missile tracking radar. The battery control officer, stationed in the battery control trailer, is provided with all of the information and controls necessary to engage targets effectively. A series of lights and a meter show the battery control officer the number of rounds prepared for firing and the progress of the fire unit in accomplishing the steps necessary to prepare and fire the round. Prior to firing, the predicted point of intercept and the present position of the target are continuously displayed on the two plotting boards in the battery control trailer. With this information, knowing the rules of engagement and the restricted areas, the battery control officer determines the most advantageous time to fire the round. After the round has been fired, these two plotting boards plot the course of the target flight paths. Controls necessary for premature or delayed detonation of the warheads are incorporated into the system. The Nike system is designed to operate with three sections per battery and four launches per section, but may use a smaller number. The battery is only 25% mobile and is classified as a semi-mobile battery. The CORPORAL Battalion is the firing battery rather than the battery. It is fully mobile and consists of a battalion headquarters, a headquarters and service battery, a firing battery and a medical detachment. The headquarters and service battery provides the administrative, supply, mess, motor maintenance, survey, fire direction and communications elements in the battalion. The firing battery is divided into a guidance platoon and two firing platoons. The guidance platoon contains both the operational personnel necessary to guide the missile and the specialist personnel required to maintain the fire control equipment. Each firing platoon contains sufficient personnel to check out, assemble, fuel and fire missiles. Personnel within this platoon are also equipped to perform organizational maintenance on missiles and associated firing and test equipment. The medical section, in addition to performing the normal functions of such a unit, is specially trained in the treatment of injuries resulting from exposure to nitirc acid, aniline and electric shock. The CORPORAL Battalion is assigned to a Field Army and may or may not be attached to a Corps. A battalion not attached to a Corps may be given a tactical mission of general support of the Field Army; general support of the Field Army -- reinforcing a specific Corps Artillery; or reinforcing a specific Corps Artillery. A battalion may be assigned a mission of general support of the Field Army -- reinforcing a specific Airborne Division Artillery, or air-landed Infantry Division Artillery, which is in a deep objective area. When a battalion is attached to a Corps, it is normally assigned a mission of general support of the Corps. The Force Artillery Commander normally selects primary areas for CORPORAL Battalions under his control. A CORPORAL Battalion Commander makes the detailed reconnaissance and selection of these positions. Normally the battalion occupies a position area with a common perimeter, requiring an area of about 1000 by 1500 meters. The position area should have good access roads and firm ground as well as good natural cover and concealment. CORPORAL position areas constitute a prime target and will be the subject of diligent search by enemy intelligence and target acquisition agencies. All possible measures must be taken to preclude identification of the CORPORAL position area. Fire planning and fire support coordination are functions of higher artillery headquarters. Once the fire mission is received at battalion the firing data is computed and final missile preparations are completed. The radar is locked in azimuth on the target line, the computer and doppler are then readied for firing. 15 minutes prior to firing the countdown is started. As the missile is fired it rises slowly and vertically for the first few seconds. Then by preset programming it pitches toward the target and moves laterally into the radar beam. The radar tracks the missile and provides the computer with the missile's location in the sky. The computer compares this information to a standard trajectory and generates commands to keep the missile directed toward the target. Radar transmits these commands back to the missile. The missile's velocity is measured by the doppler radio and assisted by the computer, shuts off the rocket engine when the missile reaches the appropriate speed consistent with the desired range. After shut-off the missile follows a ballistic trajectory toward the target and is guided by the radar in azimuth only. At appropriate zenith of its trajectory, the missile's location and velocity is again measured and compared to the standard trajectory. Any predictable range error will result in a computation of a final range correction maneuver which is sent to the missile immediately. The command for this maneuver is stored on board the missile until it reaches denser atmosphere where its control surfaces are most effective. There are three principal elements within this Self-Propelled Howitzer Battery organization; the battery headquarters, a detail section, and the firing battery. The detail platoon has the communications and survey personnel necessary to support the battery's operations. The firing battery, the largest element of the battery, is commanded by the executive officer. It consists of a firing battery headquarters, four howitzer sections and an ammunition section. The 8" howitzer battery is the general support weapon of the field artillery and is normally employed in battalion-sized organizations; however, a battery or either of its two platoons can operate independently in certain tactical situations for limited periods. The battery is 100% mobile. The 8" howitzer battery may receive a fire mission while on the march or while in a prepared position. If the battery is on the march when the fire mission is received, the howitzers are immediately moved off the road and emplaced. The spade is dropped and the weapon is backed onto the spade. The turret rear doors are opened and the crew prepares the weapon for action. The battery executive officer lays the weapon on the azimuth of fire as aiming posts are placed out. The fire direction center computes the mission and sends firing data to the weapons. The projectile is fuzed and placed on the loading tray, and power rammed into the breech recess. The powder charge is inserted with the primer. The gunner places deflection and elevation on the panoramic telescope and traverses the turret electrically to the aiming posts. Upon command of the chief of section, the weapon is fired sending the 200 lb HE projectile on the way to the target. The HONEST JOHN Missile Battalion is authorized by TO&E, a total of 19 officers, 4 warrant officers, and 261 enlisted men. These officers and men make up the Battalion Headquarters, Headquarters and Service Battery, Medical Detachment, and Firing Battery. Within the Headquarters and Service Battery there are 10 sections: Headquarters and Service Battery Headquarters, Operations and Intelligence, Survey, Liaison, Communications Platoon, Assembly and Transport Platoon, Personnel, Maintenance, Mess, and Supply. The Firing Battery is composed of two platoons each of two sections. Each of these sections is responsible for the operation of one 762MM Rocket Launcher. The 762MM Rocket is a short-range weapon designed primarily for targets of opportunity. It is usually in general support of a division. The rocket launcher is a highly mobile carrier, thus the emphasis is centered upon speed both in firing and in tactical movement to capitalize on targets of opportunity. The battalion itself is 100% mobile. The rocket itself is free-flight, that is, there are no electronic flight control gear since the accuracy of the weapon depends solely upon an initial azimuth lay. After firing, the rocket becomes a missile immune to countermissile electronic interference. Thus, once fired, the HONEST JOHN Rocket is a weapon delivering an atomic warhead comparable with the larger missiles requiring intricate and sometimes unreliable electronic guidance systems. The simplicity of operation and highly mobile characteristics of the HONEST JOHN makes it of prime importance in tactical use. The artillery commander has at his call a weapon capable of neutralizing strategic-sized targets, yet requiring only a minimum of notification or support. To facilitate handling between the ammunition supply point and the battalion position area, the rocket is divided into three major components. These components, consisting of the warhead, the rocket motor, and the fins, all of which are rapidly assembled near the firing site. Eight spin rockets, set ninety degress apart are contained in the forward end of the rocket motor. Activation of these spin rockets as the missile leaves the launcher reduces inaccuracies caused from thrust malalignnent. 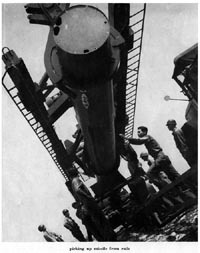 Upon receipt of a fire mission, the launcher with a rocket loaded on the rail moves from a concealed position to the firing site. As the vehicle stops with its sight mount over the surveyed hub, three crewmen lower the side and rear jacks while other crewmen elevate and extend the launching beam to the firing position. The gunner lays the beam on the proper deflection in the same manner as a conventional artillery piece. As these operations are being accomplished, the rocket specialist is inserting the igniter in the pedestal, sealing the forward end of the rocket motor with the heavy closure plug, and arming the spin rockets. With this completed, the electrical circuits are connected and the rocket is armed and ready to fire. The gunner and one canoneer set the firing deflection and elevation and stand by to apply final low level wind corrections. Low level wind measurements are obtained from the wind measuring set, converted to firing data and applied to the launcher immediately prior to firing. With wind corrections applied the crewmen take up positions on the perifery of the firing site and wait the final countdown. At the count of zero a button is pushed on the firing panel box. A split second later a gust of yellow orange flame bursts from the nozzle end of the rocket. For an instant the Honest John appears to nudge forward hesitatingly on the launcher rail. Then it surges into space with a roar at an ever mounting speed. After the rocket leaves the launcher the crewmen rapidly march order the section. The tell tale dust cloud makes it imperative that the section displace immediately, to avoid enemy counter fire. Upon arriving at a new hide position the crewmen transfer another rocket onto the launcher, and await the next fire mission. The battalion is capable of firing four rockets simultaneously. The 280mm Gun Battalion is composed of a Headquarters, and a Headquarters and Service Battery, which directs, administers and furnishes logistic support, and three firing batteries of two guns each. Each firing battery has its own survey and fire direction and is capable of almost independent action for a period of up to two weeks. The Headquarters and Service Battery normally supplements the Firing Battery with communications personnel and equipment, and additional ammunition carrying vehicles when the battery is separated from the battalion. In a tactical situation the guns are placed in positions of concealment with batteries separated by about 8,000 to 12,000 meters. Guns are moved frequently to make their location by the enemy more difficult. Communications is by telephone as much as possible for the same reason. The entire battalion is 100% mobile. The gun with its transporters, in traveling position, is about 3.5 meters wide, 27 meters long, 4 meters high and weighs about 71 metric tons. This great weight makes detailed route, and especially bridge, reconnaissance extremely important. The size, in itself, does not pose so great a problem because of the high degree of maneuverability. This piece can make a right angle turn in a walled intersection of two streets which are 9 meters wide, can move laterally, and can execute a 360 degree turn in a circle 90 meters in diameter. In the 280mm Gun Battalion, movement to a firing position is normally done only under the cover of darkness or during period of very low visibility. A well-trained crew under average condition can occupy a firing position in 12-15 minutes. Movement out of a position after firing normally required approximately 10 minutes. Firing positions are prepared in advance and survey completed to a stake which marks the location for the center of the turntable. Other stakes are used to mark the direction of fire. A few minutes before the arrival of the gun, the line of fire and center of the turntable are marked with white tape to guide the chief of section and driver, in employing the piece. At night, signals are given by the chief of section to the drivers and winch operator by the use of socially modified flash lights. This is the only cannon in the United States Army capable of full circle traverse without displacement. This capability is useful in engaging targets of opportunity to the flanks or rear, and in those situations in which the direction of fire is such that transporters could not set the gun down and have room to move away. The gun fires a shell weighing 272 kilograms a distance of 27 kilometers. It is probably the only gun in existence which was designed specifically to fit the ammunition. The US Army had developed a new 280-mm cannon which could fire atomic shells whose destructive power was approximately equivalent to the atom bomb dropped on Hiroshima. Because of the effectiveness of this weapon, it was considered an excellent means of forestalling a Soviet threat and strengthening US forces in the event of an invasion of Western Europe. Each battalion had 6 atomic cannons and an aggregate personnel strength of 494. The 216th is to be stationed in Darmstadt. 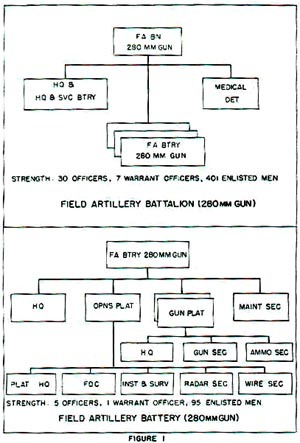 280mm Gun battalion and firing battery organization, 1955. Battery B, 264th FA Bn at Des Gouttes Kaserne in Bad Kreuznach in 1956. 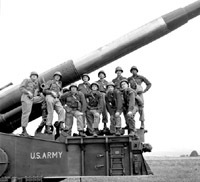 In October 1953, the first unit equipped with atomic artillery arrived in the command, and on 23 October atomic field pieces were exhibited at Mainz, Germany before the French, German, and American press. They were used in fall and spring maneuvers in order to give troops practice in simulated atomic attack and defense action. The atomic artillery were also used as regular heavy artillery, firing conventional ammunition. Based on the WWII-era 240-mm howitzer, the 280-mm gun was designed to fire a nuclear projectile. Suspended between two supporters (special tractors with hydraulic jacks), the gun had a cruising speed of 25 miles per hour. Hydraulic rammers loaded conventional or atomic shells, which could be fired up to 18 miles with great accuracy. The 280-mm gun battalion was designed for assignment to an army or corps and was meant to support frontline infantry troops and to protect vulnerable stationary installations. 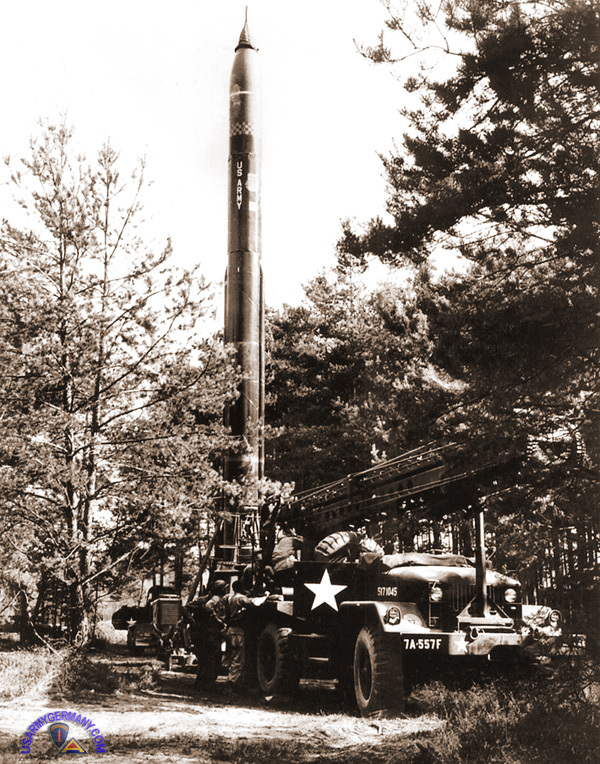 Until 1957, a rocket battery armed with 762-mm Honest John rockets was normally attached to the battalion for administrative and operational control. Initially, the 280-mm guns were the smallest weapons that could fire a nuclear projectile, but the guns were too unwieldy and immobile to be entirely satisfactory. 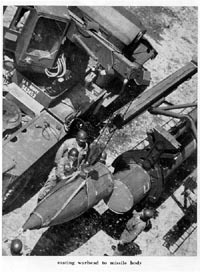 Subsequent development allowed the Army to deliver nuclear warheads with conventional cannon artillery, rockets, and guided missiles of varying sizes in close support of ground troops, and the 280-mm guns were phased out by the early 1960s. 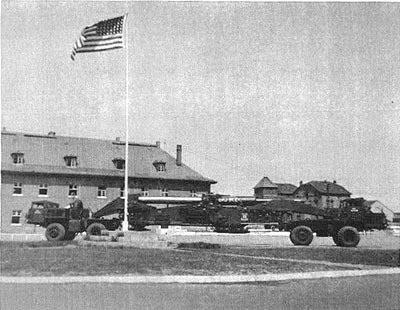 A 280-mm gun battalion consisted of a headquarters; a headquarters and service battaery; a medical detachment (that was deleted from the TOW in 1957); and three gun batteries, each with two guns. 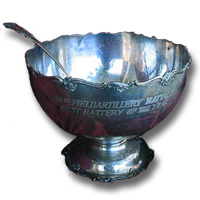 The image on the left shows a German made, silver-plated, nickel punch bowl and ladle engraved "264th Field Artillery Battalion, Best Battery of the Year". On the side of the bowl, it is engraved with: "Btry A 264 FA BN 1957". Who can tell me more about this "Best Battery of the Year" award? 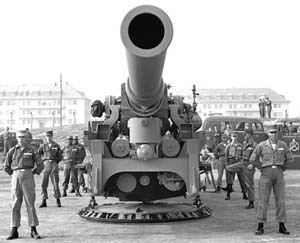 The crew of a 280mm M65 "atomic cannon" poses for photographers during a demonstration of USAREUR's weapons for nearly 200 German, French and American newsmen at the Mainz Ordnance Depot, Oct. 1953. 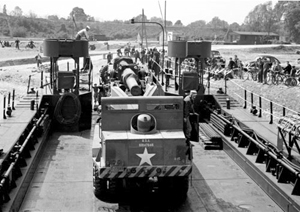 A 280-mm M65 is loaded onto an LCU of the Rhine River Patrol during Operation Big Lift (not the 1963 event). I was assigned to the 264th FA Bn (280mm Gun) on April 12, 1957. I served with the 264th at Bad Kreuznach until late June of 1959 when I returned to States for discharge. The 264th was redesignated 3rd Bn, 82nd Artillery in June of 1958. We were moved north to Giessen, Germany and initially the whole battalion was based at Rivers Barracks. After a few months, due to cramped space, HH&S and A Batteries were moved to the QM Depot in Giessen across town. B & C Batteries remained at Rivers Barracks where they shared the post with the 594th FA Bn and the 63rd Engineer Bn. (Webmaster: 63rd not 93rd as previously reported.) The 594th was a 8" self propelled unit. Enjoyed seeing the photos of Bad Kreuznach post. I lived in building in the first photo. I do not recall in my time in Germany of our being assigned to any artillery group. I was always under the impression that we were just part of V Corps. I was personnel clerk in HH&S. I cut orders for the Bn. and also arranged port calls for the troops going home. I also typed the morning reports that had to be done every morning by 9 a.m. While we were at Bad Kreuznach, around the spring of 1958, we shipped home for discharge, individuals that were not high school graduates. We referred to this as the "dumb bell" discharge. We sent home a couple hundred, mostly canoneers from the gun batteries. One of my favorite tasks was sending home the disliked officers by boat. In those days about sixty percent of the troops had to cross the Atlantic on troop ships. I was in the vantage point of being able to arrange the mode of travel. Top notch commanders were assured of my getting them an air port call through Frankfurt. The ones that were known to be hard-nose rank pullers I would let my friends in 7th Army headquarters know that I thought this or that officer would make a fine troop ship officer on the 10 day trip on the Atlantic. Bad Kreuznach, Germany, September 8, 1956: Battery C's 2nd Gun Platoon from the 264th Field Artillery Battalion, which set a 280mm gun firing record, poses next to the "atomic cannon." They are, in the front row from left to right, 2d Lt Loyal G. Hightower, Sfc Wilbur H. Smith, Sp3 Clarence B. Rabe, Sgt Harry Erickson, Sp3 Joe Stachon and Pvt William Leady; in the back row, Sp3 Anthony J. Popelka, Sp3 Burgoa E. Figueroa, Sp3 Frank R. Pereyda and Pfc Edward Welch. The massive 280mm gun was capable of firing both conventional and nuclear shells; it was transported on two vehicles whose drivers kept in touch by telephone. 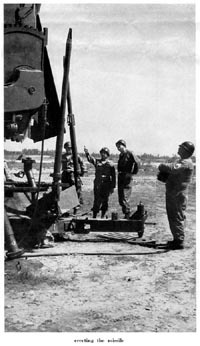 S&S Page contains a link to several photos taken by Gene Bane of soldiers from the 264th FA Battalion with the atomic cannon. I was stationed in Darmstadt Germany from Feb 1957 till May 1959. I was with the 216th FA Btn (280mm cannon). Most ineresting story is the night we were running with "cat eyes," on our way to an off-post firing position in Graf. The driver of the rear unit was tracking the gun and those attached to this cannon know this is a no-no. Rounding a bend in the road, the gun ran off the road and into a lake. Nothing we had could pull it out, and the next morning, we got an M60 tank retriever to pull us out. We then had to repair the damage to the road, and while digging found a cache of WWII german weapons. An interesting 24 hrs. I also would be interested in contacting any other members of this unit. I can be contacted at jdet@snip.net. Thanks, enjoy the web site. I was stationed in Nürnberg, Germany from 1958 to 1962 with the 39th Artillery. I was assigned to B Battery and served as Gun Chief and First Sergeant for about 3 years and 6 months and of that time we spent about half of it in the field. This was a 280 mm cannon unit and I was told that we had the gun that fired the Atomic test round at the Aberdeen Proving Grounds. I really did not know there were so many 280mm units in Europe. We were in Merrell Barracks there in Nürnberg and made many trips to Grafenwöhr for training. There was another location besides Graf that we went to but I can't think of it right now. In 1960 or 1961 my section participated in a river crossing exercise. Lt Pollard was our section leader and I remember spending about 2 weeks on the Rhine River practicing driving upon a floating bridge and driving back off again. I think what we were trying to do was see how well the bridge would handle the gun because as I recall it weighted about 85 ton which was about a ton per foot. While looking at the web page it brought back many fond memories. I am retired from the military now and have been retired since 1972. 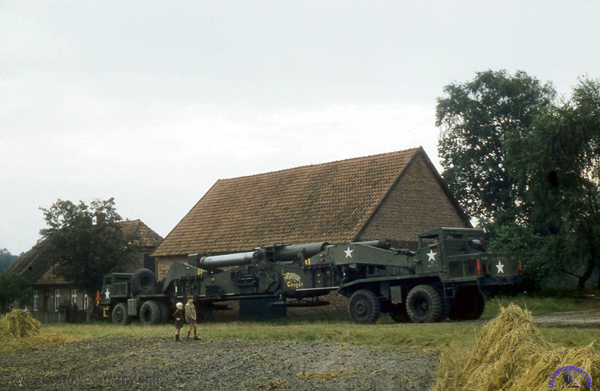 The 613th FA Bn (280mm) arrived in March 1957 (probably as an Operation Gyrsocope unit that replaced the 59th FA Bn in Pirmasens). The battalion was initially stationed in Pirmasens, but later moved to Bamberg. I was stationed in Germany in Schwabach, Germany at O'Brien Kaserne in 1960 as a Sgt in the FDC of Btry C, 3rd Gun Bn, 80th Arty / which was soon changed to Btry C, 3rd Gun Bn, 39th Arty. Our HQ and Btry A were in Nuremburg at Merrill Barracks & B Btry was in Munich. We had the 280mm Atomic Cannon. I went to the 7th Army NCO Academy in Bad Toelz at Flint Kaserne. After reenlistment I was assigned to HQs Btry, 2nd Gun Bn, 38th Arty ouside of Darmstadt, Germany, at Ernst Ludwig Kaserne - again with 280mm Atomic Cannon. I do not remember what Group we were in. I thought it was the 142th Arty Group. But I am not sure. I would like to find my units and locations somewhere on the website so as to know I did not serve in vain. 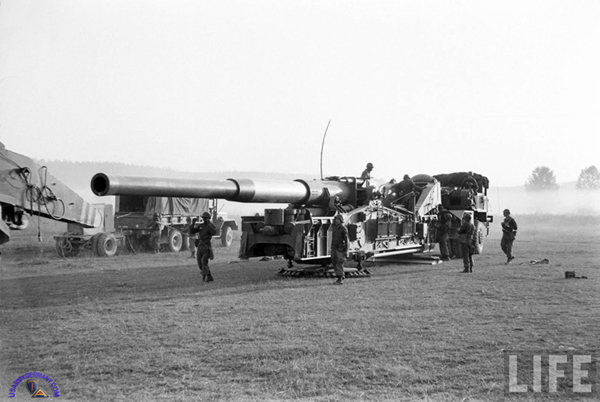 It appears that 3rd Gun Bn, 80th Arty with a battery (A) in Schweinfurt and another (B) in Bamberg in 1960 was equipped with the 280mm atomic cannon. There might have been a C Btry stationed at O'Brien Barracks in Schwabach during this same period. 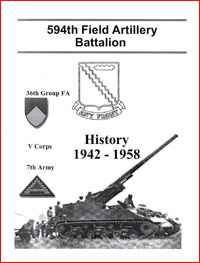 In early 1958, all US Army Field Artillery and Anti-Aircraft Artillery were combined as a single branch known as the Artillery (Arty) Branch and several Artillery Regiments were formed, including the 82nd Artillery Regt "Dragons". Three Battalions (1st, 2nd and 3rd) of the 82nd Arty Regt served in Europe under separate commands. The 1st Msl Bn, 82nd Arty was formed in Italy on 24 June 1958 and was equipped with the HONEST JOHN rocket. The 1st Msl Bn, 82nd Arty was deactivated in Italy on 20 April 1964. 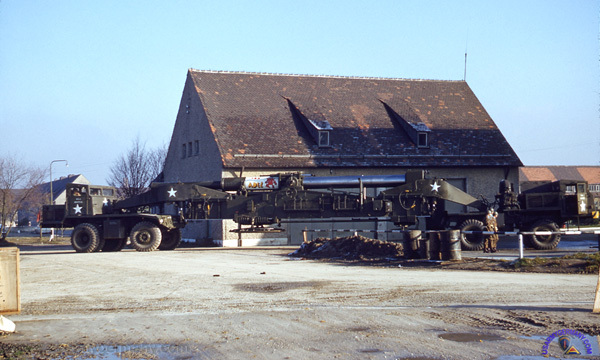 The 2nd Missile Battalion, 82nd Artillery, a CORPORAL missile unit, was activated in Germany on 25 June 1958 (organic elements concurrently constituted). While in Germany the battalion supported the Army's Cold War mission of defending Germany from Warsaw Pact countries. The battalion was inactivated on 25 March 1964. 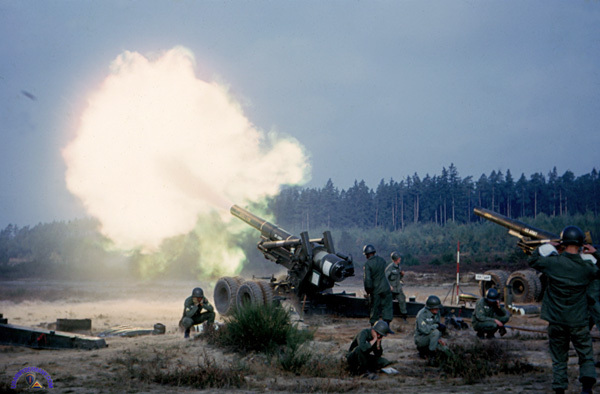 Redesignated on 1 June 1958 as Headquarters and Headquarters Battery, 3rd Gun Battalion, 82nd Artillery (with its organic elements concurrently constituted), the battalion activated on 25 June 1958 in Germany and was equipped with 280mm cannons capable of firing nuclear rounds. 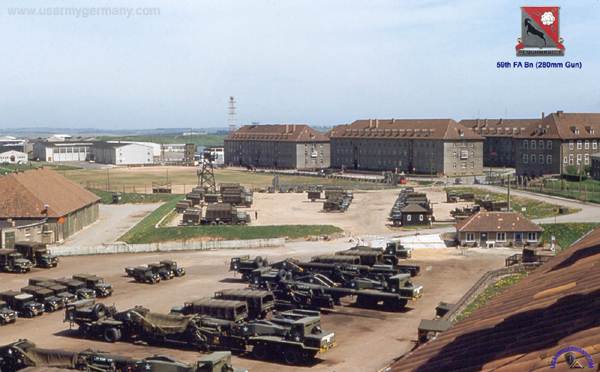 The 3/82, stationed at Rivers Barracks in Giessen, was the last 280-mm unit in Seventh Army (early 1960s). This unit operated a battery in Schweinfurt. It inactivated there on 20 December 1963. I was with Hq Btry, 38th Field Arty in Darmstadt, Germany, from 1960 to 1962. We had six 280mm Guns assigned to "A," "B," and "C" Battery -- commanding was a Col Miller, I believe. The post was also home to the 18th Field Arty (8" Gun) towed by a 10-ton truck, I believe, and the 28th Arty, an HONEST JOHN surface-to-surface rocket unit. I understand that the 38th is now an MLRS unit posted to Camp Stanley in South Korea. Can anybody provide more details on the other battalions that were redesignated? I came to Ansbach with the 2nd Bn 40th FA in 1962. I was immediately introduced to the joys of camping in the snow. Very soon after that I became a part of the 210th's band where I stayed for the rest of my hitch. One of the many gigs I played was one at the SS barracks where we were to show our NATO partners what we had in the way of heavy weapons. 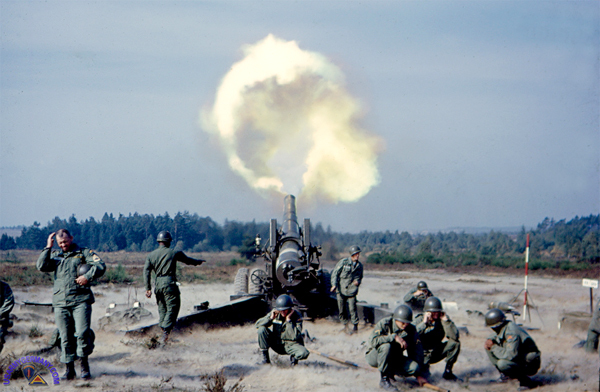 In 1963, the 210th Artillery Group, US Army became involved in a project to provide our NATO allies with a demonstration of the conventional heavy weapons deployed by the US Army in Western Europe at that time. Merrell Barracks (formerly the Nazi SS Kaserne) was chosen to be the stage for this show because of the unusually large parade field in the center of the equally over-sized post buildings. It was indeed an impressive setup. Everything about this place was designed to show the world that when the Nazis did something, they did it “right.” The heating plant for the facility, with its color-coded pipes and valves, had a multi-story wall of windows so that its technical complexities could be viewed from the parade field. 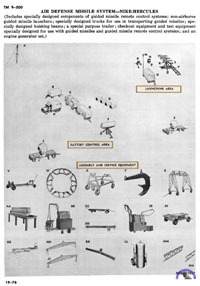 The order of march for the demonstration called for each weapon (all were SP’s) to drive onto “center stage” where a narrator would describe its many features. Then, before exiting “stage right”, it would fire a reduced powder charge just to make sure no one was dozing-off. This was pretty effective. Starting with an M-60 tank and progressing through 105mm SP’s, 155mm SP’s, and 8” SP’s, the show culminated in the setting-up and firing of a 280mm gun. Of course, each gun had a report greater than its predecessor. Well, almost. When the star of the show, the 280mm gun (which was loaded with ½ of a 155 powder bag) fired, the long barrel acted like a chimney and a large puff of smoke and sparks spewed out. The effect of this was absolutely ludicrous. The OIC for the demonstration was more than a little annoyed. Everything else was strictly “top-of-the-line." He had converted the NCO Club into a General Officers’ mess, complete with chandelier and Rosenthal china on loan from one of Nürnberg’s museums for the occasion. He discussed the problem of the gun with the 280’s battery CO. Surely something could be done to make it “pop” at least. The lieutenant decided to try for a little more compression. He would take a cardboard box from the PX, cut an 11” circular disk from it, and place the disk ahead of the powder. He had his modification in place just in time for the final trial run-through of the program. It was a dreary, overcast day, with the clouds hanging very low over the city. As each gun was rolled-out and fired, the echoes of the explosions bounced back and forth around the buildings. The 280mm gun was set-up. Most of the soldiers in the area were unaware of the lieutenant’s modification. Even if they had known, they would not have suspected that anything special was about to happen. Surprise! Surprise! The resulting thunder-clap shattered virtually every window on the inward side of Merrill Barracks, including the window-wall of the heating plant. In the area of Nürnberg immediately surrounding the barracks, many more windows were gone. At the NCO Club, the chandelier came down, bringing a section of the false ceiling with it. The falling ceiling landed on the antique china, doing significant damage to an irreplaceable collection. As I try to think back past the forty intervening years, I can’t seem to remember a thing about the day of the actual NATO presentation. The day before… well, that was something else. NUERNBERG, Germany (UPI) - The U.S. Army has announced that it is retiring the world's first atomic cannon -- a 280-mm one. Old soldiers are prone to get misty eyed about the going of cavalry horses, old comrades and mascots and the passing of "AWOL" is no exception. Three generals and a bugler who sounded taps showed up for the 42-ton cannon's last parade ground appearance. In an unusual display of emotion, 7th Army Hq officially described the whole thing as "depressing," It was especially tough on Sfc Grady T. Henderson of Amarillo, Tex. A decade ago -- on May 25, 1953 -- Henderson was a corporal and a member of the crew that first fired "AWOL" at Frenchman's Flat, Nev. It was the first time an atomic shell had been fired by a cannon. Henderson remembers it made a lot of noise. Said a 7th Army spokesman: "'AWOL' may have been the artillery's darling, but she never earned distinction for being a lady. "When she belched it was 660 pounds of full-throttled fury that spewed from her lips. Coupled with enough to strike fear in the hearts of the staunchest soldiers, let alone the enemy. "Therein lies the reason for her name for among the men of her 3rd Gun Battalion, it was this female savagery that is rumored to have once caused some members of her crew to go absent without without leave -- 'AWOL'." "AWOL," that old atomic age veteran, has been replaced by what the Army calls "more sophisticated" weapons. The atomic age's Big Bertha is now only a blunderbuss, the Army spokesman said. Lt Gen Hugh P Harris, 7th Army CG, and Lt Gen Louis W. Truman, VII Corps CG, joined Henderson in a final salute. "AWOL" made a final dip of her 42-foot-long nose. 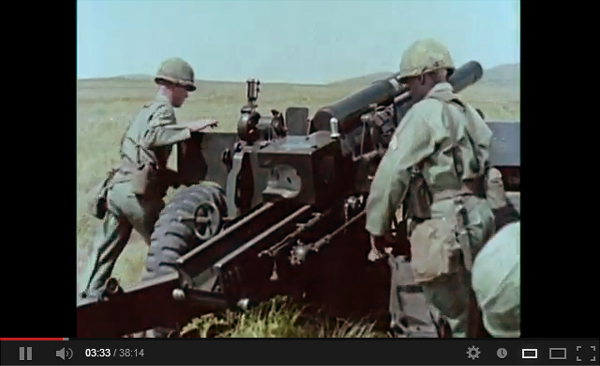 Then they shipped her off to the artillery museum at Ft. Sill, Okla.
280mm Atomic/Nuclear Artillery ( video) - 10+ min film shows lots of detail on a 280mm gun battery deployed to the Nevada Proving Ground for a live fire test with a nuclear warhead in 1953. 1st Bn, 32nd FA (HJ) Fliegerhorst Ksn, Hanau 36th Arty Gp; re-equipped with LANCE and reorg. 3rd Bn, 79th FA (HJ) Rivers Bks, Giessen 42nd Arty Gp; re-equipped with LANCE and reorg. According to USAREUR documents, the 1st Battalion / 34th Field Artillery (part of the 24th Infantry Division / VII Corps), stationed at Munich's "Will Caserne" was a "Honest John" unit. It moved to Augsburg's "Sheridan Kaserne" in 1968. I could not find it in the "Honest John" listing! Tests at Desert Rock had indicated the importance of all types of atomic weapons, whether in the form of atomic artillery, bombs, or as warheads on guided missiles. Army training in Europe embodied the use of all of these weapons. The 280-mm atomic artillery units were in constant use at all field training exercises, from division-size to NATO maneuvers. However, actual firing with conventional shells was restricted by the limited range areas available. To simulate atomic warfare during field maneuvers, Seventh Army technicians constructed a pyrotechnic device which when detonated gave the appearance of an atomic explosion, giving off clouds and producing a concussion sufficiently loud enough to be heard at least two miles from the launching site. One hundred and fifty pyrotechnic projectiles and 15 launching mortars were available for loan to the umpires of field exercises, and were used in several field exercises late in the training period. The USAREUR Intelligence School continued the orientation and training of selected commanders and staff officers in the planning and coordinatioon required for the tactical employment of special weapons. 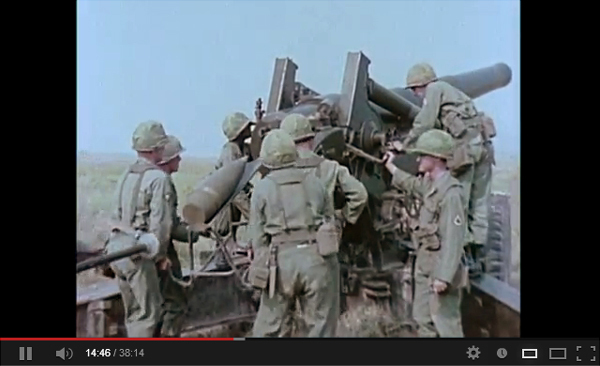 In late 1954, the first "Honest John" battery arrived in Europe. 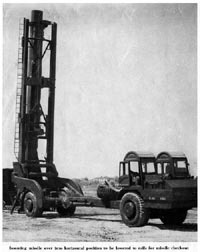 Since these free-flight rockets were all-weather weapons to be used in general support of a corps, the unit was attached to VII Corps, Seventh Army. The Honest John rocket, a surface-to-surface 762-mm solid propellant rocket, could be fitted with either of three warheads, fragmentation, chemical or atomic, and had a range of 15 miles. 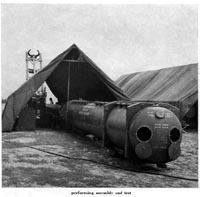 Although the "Honest John" batteries participated in various FTX's, its practice firings were limited due to a lack of suitable ranges. On 17 March 1955, the two VII Corps "Honest John" batteries fired one round each in a demonstration at the Grafenwoehr training area. 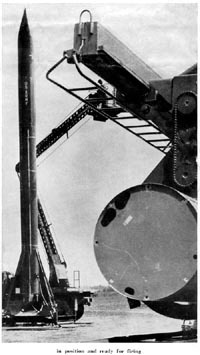 A guided missile available for training was the radio-controlled Corporal, a liquid propellant rocket, which arrived in the theater on 2 February 1955. This weapon, launched from mobile ground installations, could be used against targets 30 to 75 miles distant and could reach a speed of 2,200 miles per hour. Normally, it was to be employed as an Army weapon in support of corps troops. The lack of suitable training areas seriously hampered the addition of guided missile units. Only one "Corporal" battalion was in the theater and no NIKE units were received. At the close of the reporting period, after USAREUR had tried unsuccessfully to obtain a suitable guided missile range, US EUCOM was conducting negotiations to obtain a range in Africa where the various units could train. The 762-mm Honest John was a solid-propellant fin-stabilized supersonic free-flight rocket developed by the Douglas Aircraft Company as a direct-support atomic weapon carrier. The early version of the Honest John was an improvised weapon that linked a nuclear warhead with a mobile surface vehicle. The rocket was based on a German experimental rocket and, partly, on a rocket designed by the US Navy. 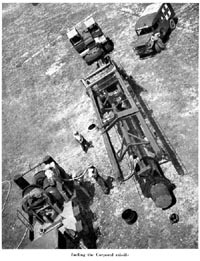 The launcher was a simple track (rail), mounted on a standard Army truck. It's range was 16 miles. An improved Honest John was available by 1961 with a range of 25 miles. The Honest John was aimed and fired in the same manner as cannon, and it would be used in terrain where it was impossible to move the 86-ton 280-mm atomic cannon. Between 1956-1957, the batteries were reorganized as HJ missile battalions with a single firing battery. 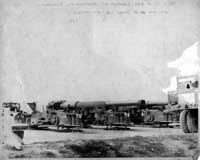 The firing battery had two firing platoons of two-launchers each. Sufficient personnel and equipment were provided to employ the firing sections individually, either as platoons or as battalions, giving the desired felixibiliy. First Lieutenant Robert B. Henry, Artillery, is Executive Officer, 3rd Field Artillery Battery (762mm Roclet), in United States Army Europe. CALL IT what you may -- and we often use the German designation, Der Wahrliche Johann -- the Honest John 762mm. Rocket is filling the vital need for which it was designed. It has proved that it is ready and able to meet its assigned task in the North Atlantic Treaty Organization family of forces. Much has already been said and written concerning the development of this new artillery weapon by the scientists, engineers and others who designed, planned and perfected it. But we -- the ultimate consumers, the men who man and use it -- are the experiment in the field. We believe that a report and appraisal from our angle is about due. We can report from our own experience, because three or four times yearly we practice tactics with live firing at Grafenwohr. This is followed by a field training exercise at the end of the training year. As a result, we are convinced that we are ready for any emergency. Der Wahrliche Johann now is employed by separate batteries, assigned to field armies and further attached to corps. There are three launchers in each battery, with a headquarters section, communications section, survey section, radar section and fire direction center. The launcher sections are supported by a rocket assembly and transport platoon. Each battery has an authorized strength at present of 8 officers and 127 men -- but this may change when plans for transformation into a battalion are perfected. Such a change, however, will be primarily one of administration, since just one launcher will be added to the present set-up and personnel will be built up to meet new administrative needs and requirements. While the general manner of employing the new weapon may of course vary, the most accepted use is to dispatch the launchers from a central rendezvous, or "hide" area. The great mobility of the launcher enables it to move long distances over rough terrain. Arrived at the firing site -- usually a previously selected and surveyed position -- the crew faces a gunnery problem that is somewhat unique to artillerymen. The fire direction center is located in the battery rendezvous area. The launcher crew communicates by wire or radio. No charts are necessary in the Fire Direction Center since firing data is computed mathematically. Having received the necessary aiming data, the launchers get rockets on the way. Because the resulting burst of flame and noise pinpoint the place of launch, the launching unit immedintely withdraws to the central "hide" area. It is entirely possible to move all three launchers at one time to widely separated sites and still fire them simultaneously at the same target or at different targets. Should the target change after the fire mission has commenced, the launcher can easily be traversed onto the new target. These tactics are practiced three or four times yearly. Live firing is conducted at Grafenwohr, where the weather varies between wet and very wet so that the unit and its men necessarily undergo proving conditions. We usually fire about twelve rockets each year. The battery receives three tests, culminating in the big Corps Artillery test at the end of the training year. This test, toward which all efforts are naturally pointed, lasts 30 hours during which three live rockets are fired and three are simulated. In the Corps Artillery tests, the unit is alerted early in the morning, and immediately moves out to an alert assembly area. There the battery commander, accompanied by reconnaissance personnel, meets the task force commander. After learning the location of the battery rendezvous area, he is allowed to move selected portions of the battery forward to this area during the day to prepare launcher sites and establish communications. Meanwhile, in the rear assembly area, rockets are being assembled. That night the main body of the battery moves forward under cover of darkness. Loading of the launchers begins as soon as the battery reaches the forward area, and, very soon fire missions begin coming in. Each launcher gets off one live round, then displaces to fire a simulated mission. The test is completely run off by the next morning. As important as this event is, we consider the yearly field training exercise to be the real test. Then it is that the battery plays a war game across the German countryside. Moves come at any time, for any distance, over unknown territory that must be "reconned" to conceal the 45 vehicles. Launcher sites must be selected. Although no live ammunition is fired, time and space factors are realistically played for every mission. The field training exercise usually runs for eight days. When the exercise is completed, the unit has added confidence in its own ability, plus a better realization of actual field problems that would be encountered in an emergency. Most of the participating officers and troops have been trained entirely by the battery. They are not graduates of MIT; they are not walking brains; they are not led by older Army men who have been in the rocket business since its inception. With normal intelligence any man can learn to handle any job in the battery. Technical schools are in order for some personnel directly concerned with the special weapons capability of the unit, but if necessary the unit itself is capable of conducting such specialized courses and related training. Most of the men are young, and their officers, too, are young men. The ranking officer is a captain, and the lieutenants usually are on their first tour of duty. Possibly never before in any army has so much responsibility been shouldered by such young men. Today Honest John is no longer on trial in Europe. It has proved that it is ready and able -- and the men who man it are willing. By any other name --Honest John or Der Wahrliche Johann or anything that future foes might dub it -- this superb artillery weapon will shoot as sweet and fair and far and true as any artilleryman could hope. We who man it can assure the world of that. WITH 7TH ARMY IN THE FIELD (UP) -- The U.S. Army's mlssilemen combine electronics with hit-and-run Indian warfare in their assaults. They use the electronics to find their target -- often more than 20 miles distant -- and the Indian tactics to stay alive and shooting when the enemy hits back with its own missiles. Capt James Keeley, a young West Pointer who commands an 11th Abn Div Honest John missile battery, said that he has to "hit and hide" with his 20-ton truck-mounted launchers. Keeley is helping provide the atomic punch for 7th Army's 123,000 troops maneuvering in Exercise Sabre Hawk. "We set up in our 'hide position,' usually in a woods, go out and fire, and then come back," he said. "We fire and get out of there because the chances are very good that there'll be another one just like it coming at us." Keeley said that enemy forces ran quickly compute the exact launching site of a missile by tracking its flight with radar and have a missile of their own on the way within minutes. He said the hide position is five miles away from the firing site "in any direction." This distance makes it impossible for the enemy missile to damage the launcher or hit the crew. Keeley's two platoon commanders. Lt Paul Kelley and Lt Arthur D. Wells, said that their weapon is ready to fire within 50 minutes of the command if the missile is already on the launcher. "If It's loaded and checked out, we can fire within 10 minutes of the command," Wells said. The command to fire the missile can be given only by the division commander, it was pointed out. Wells said that it takes 1 hour and 20 minutes to put another missile in place after a firing and have it ready to go. Kelley. Wells, and most of the the rest of the Honest John crew are conventional artillerymen who have converted to missiles since the Honest John was assigned to divisions last summer. "It's tougher work, longer hours, and more night duty," Kelley said, "but you feel you're doing a bigger job. It's more complex equipment i and it's much more Interesting." Sgt Norman W. Roberts Is chief of detail of the missile squad. He had the same job with a conventional 155-mm howitzer unit before the missiles arrived. He says he wouldn't want to go back to the old style. "It's the same work, but at a much higher level," he said. The Honest John, a free-flight rocket that is aimed instead of guided, depends on the fire control of the division's artillery staff. It has no electronic aiming or guiding equipment at the launching site but gets its data from the division. The Army's Corporal is fired straight up and is guided in flight by its crew, operating from electronic vans near the launcher. 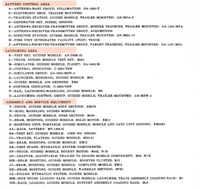 Other details of the missiles and their number in Europe are classified. The Army also has two cannon capable of firing atomic projectiles. 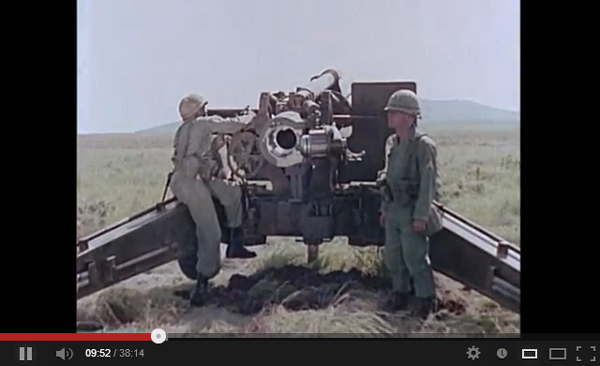 They are the giant 280-mm and the eight-inch howitzer. The Corporal ballistic surface-to-surface guided missile was developed to provide the Army with an atomic delivery system which could both extend the range of field artillery and provide ground forces with a readily available means of all-weather, heavy fire support. The missile had sufficient range to provide heavy fire support for an entire Corps. It was capable of hitting tactical targets over 75 miles away. 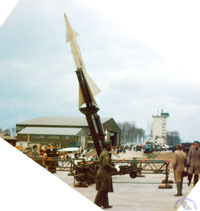 The Corporal was considered a short-range missile. It lent itself to being employed at the Army level. FAM Bns (Cpl) were assigned on the basis of three (3) per field army (1956). Initially, the FAM Bn was organized like standard FA bns with a battalion HHB, firing batteries and a Svc Btry. Later, the Bn became a single fire unit organization which consisted of a headquarters and service battery (HSB) and one (1) firing battery (1956). The Corporal missile is the only operational surface-to-surface ballistic guided missile in the free world today; it is already deployed overseas in Germany and Italy (SETAF). The Corporal provides the combat commander with an all-weather, day-or-night capability of delivering atomic or non-atomic fires at ranges much greater than that of the Honest John. In March 1957, the 531st FA Msl Bn fired the hundredth Corporal missile at a target on the White Sands Proving Ground range in New Mexico. The Bn had just returned from duty in Europe and the round was part of the annual service practice. The Corporal missile, the first surface-to-surface ballistic guided missile with a range of 25 to 75 nautical miles, was designed to provide the Army with a weapon that could deliver a nuclear warhead, extend the range of field artillery, and furnish a readily available means for all-weather heavy fire support. Fielded in 1955, the Corporal I proved to be less than satisfactory. The liquid-fueled Corporal was susceptible to countermeasures, requiring many items of specialized ground equipment and a correspondingly large number of personel; its mobility was poor and its fueling process slow; and the intervening time between target assignment and actual firing was excessive, given the fuel's highly corrosive nature. All defects were to be avoided in the second generation (Corporal II) of the missile. Despite some improvements, however, many of the criticisms of the earlier missile also applied to the later models. By 1957, eight Corporal battalions were assigned in Europe (six with USAREUR, two with SETAF) and five in the United States, with the latter number subsequently reduced to four. Despite the shortcomings, the Corporal set the stage for improved tactical-support guided missiles and remained operational until 1964, when the solid-propellant Sergeant replaced it. The objectives of field artillery and rockets were to provide all-weather fire support for land, airborne, and amphibious combat operations beyond cannon-range coverage; great destruction against "hard" targets, such as tank formations and fortifications; and fire support for combat troops making deep penetrations, such as airborne assaults or armored breakthroughs. Initially, the missile and rocket units were organized in much the same manner as conventional artillery units, with a battalion headquarters and headquarters battery, medical detachment, three firing batteries, and a service battery. In the case of the Corporal, a battalion had an aggregate strength of about 850. This structure was soon reduced by one missile battery, to an aggregate strength of 531. Tests, however, showed that so large an organization was unsatisfactory for any unit whose primary mission was the delivery of nuclear forepower. To achieve a sufficient large volume of fire with conventional artillery, several guns were grouped into batteries and several batteries to battalions. However, to achieve the same volume of fire with the nuclear-capable Corporal or Honest John, only one missile was needed. Therefore, to exploit the potential of three missile-firing batteries in a battalion, the batteries and missiles would have to be dispersed over a very large area, thus counteracting the operational and logistical advantages of centralized battalion control. These considerations resulted in a single-fire unit organized with a headquarters, headquarters and service battery and one missile battery with two missile-launching sections. All support functions, including ammunition supply, motor maintenance, and personnel administration, were consolidated at battalion level. The units had limited capability for simultaneous defense against attack and no capability againts air attack, thereby requiring that other units provide local security support. 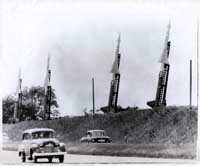 The missiles were employed in pairs to ensure timely atomic artillery fire support. However, I did not find the 515th Ord Co (GM DS). It is possible that the 515th had been replaced by the 138th Ord Co (GM DS) as part of the GYROSCOPE program that was underway at the time. Who can provide information on that? The first CORPORAL unit to arrive in Germany was the 259th FA Msl Bn in January or Fenruary, 1955. Home station: unknown. This battalion was comprised of two firing batteries, both equipped with the Type I missile. The 96th Ord Co GM DS was deployed with the 259th to provide direct support. I was a member of the 557th Field Artillery Battalion. In March 1956 we were deployed to Bleidorn Kaserne (I think my spelling is correct) in Ansbach, Germany. My memory isn't to good on details, but as I recall our commanding officer was Lt. Col. John Stevens (or Stephens), and the adjudant (or deputy?) was Maj. Dale Denman. I think that we were part of the 18th F.A. Group, and the commander was Col. Vernon Rawie. We were the only Corporal missile battalion in the Group, and, as far as I know, the second such battalion in Germany. The 3rd F.A. Battery (Honest John) was also in Bleidorn Kaserne at the time. I was a PFC, and was discharged in January 1957, and returned to college. V Corps Artillery - a Corporal unit displays it's missiles. Information provided by Klaus Stark, Germany. Going back a ways. I was assigned to the 2nd Missile Battalion, 81st Field Artillery from Jan 1961 until July 1963. The unit was stationed at Ferris Barracks, Erlangen, Germany. I was originally in the Commo Section and then assigned as the Battalion Mail Clerk. Three years ago I was surprised to find out that the unit was de-activated late 1963. My old billet now houses a German School. I know that the 2/81 was originally the 557th sationed at Bleidorn Kaserne in Ansbach. The move to Erlangen came after a field trip to Grafenwoehr. Might be of interest ... a number of old troops, at present 19, from the 2/81 have reconnected over the past three years. We keep searching out "buddies" and information on our old unit. Have enjoyed your site as have the others. I was stationed at Babenhausen Kaserne in 1961-63. Our group was the 157th Ordnance Detachment, supporting the 1st Batallion, 38th Artillery—a Corporal Missile unit. Those Cold War days were tense sometimes. On one occasion we were not really sure if it was simply an Alert or whether the “balloon went up” and explosive charges were placed around the kaserne ready to blow it. Fortunately, it was not the real thing so we spent the usual time in the field going through a mock missile launch. My MOS was 245.9, Corporal Ground Guidance Repairman. After the reassignment of SP5 Charles Carroll, I was named as his replacement—Section Chief of the Ground Guidance section. In the early months of 1963, our unit was de-activated and we were farmed out to other Corporal units in Germany. As you know, I am preparing a study of the US Artillery since WW II. In the 1958 to 1964 time frame, the 8in Howitzer Battalions, Towed and SP, were organized under T/O&E 6-415D. HHB & SVCB were the same, only the three Firing Batteries had different T/O&Es, 6-417D for the Towed and 6-418D for the SP Battery. 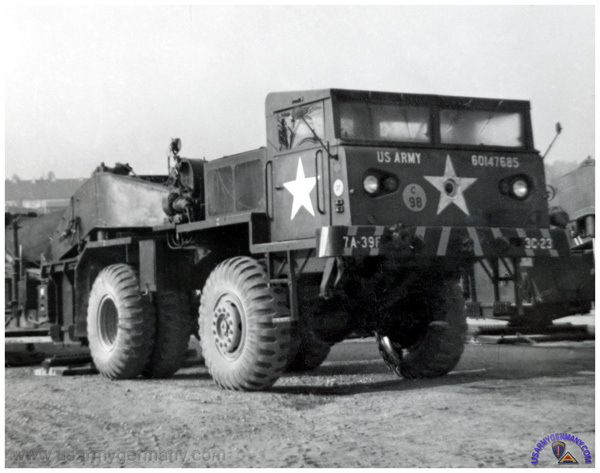 The divisional Towed 8" Batteries were equipped in 1960 with four M125 10-ton trucks as prime movers with an additional two trucks for the ammo section. The Staff Officers' Field Manual 1961 states that the nondivisional T/O&E 6-417D Towed Battery, was equipped with two M8 tractors and four M125 in addition to the standard vehicles, but that doesn't seem very logical. Do you know something about the prime movers, or do you know somebody who served in one of the Battalions during that period? Harald is writing an article on the 8in How Battalions. Does anybody have photos of the M125 that he could use in the article that will be published in a German military journal? Is there anybody who can provide some details? Contact me if you can help! The scope of this particular reflagging study is limited to non-divisional field artillery units. Tables of divisions arriving in Europe as part of the Korean War build-up (TOE 1948). Unit designation changes due to replacement of Army Reserve units by Regular Army units (1954-55). Organizational changes due to Operation GYROSCOPE (1955-1959). Unit designation changes due to implementation of CARS (1957-58). Changes to divisional tables due to implementation of Pentomic Structure (1957-59). Changes to divisional tables due to implementation of ROAD Structure (1962-64). Organizational changes due to Vietnam War resource requirements. Changes to divisional tables due to implementation ... (1970). Organizational changes caused by the Nunn Amendment. Changes to divisional tables due to implementation of Division-86 Force Structure. Changes to divisional tables due to implementation of Army of Excellence program. Unit designation changes due to implementation of the Army Regimental System (). Organizational changes due to the COHORT System. Found something that is incorrect or missing from the graph? Have ideas on how to improve the presentation? Then please contact the webmaster! moved to Neu Ulm on 1 Jun 1952. .
released from active Federal service on 18 Jan 1955 and personnel reassigned to newly activated 273rd FA Bn . actiavetd on 17 Jan 1955 in Germany . returned to US (Fort Carson, CO) on ??? under Operation Gyroscope and replaced by the 538th FA Bn. .
arrived in Germany on ... under Op Gyropscope to replace the 273rd FA Bn in Neu Ulm. .
inactivated on 1 June 1958 in Germany; personnel possibly reassigned to newly activated 3rd How Bn, 28th Arty . .
3rd How Bn, 28th FA?.. arrived in Germany on 21 Mar 1952; stationed in Schwäbisch Gmünd . moved to Neu Ulm on 6 Jun 1952. .
released from active Federal service on 6 Jan 1955 and personnel reassigned to newly activated 802nd FA Bn . .
activated on 6 Jan 1955 at Neu Ulm in Germany . at some point moved to Schwäbisch Gmünd . inactivated on 25 June 1958 in Germany; personnel possibly reassigned to newly activated 3rd How Bn, 17th Arty . ..
3rd How Bn, 17th FA?. activated on 25 June 1958 as 3rd How Bn, 17th Arty. .
redesignated on 24 Mar 1964 as 3rd Bn, 17th Arty. .
redesignated on 1 Sep 1971 as 3rd Bn, 17th Field Arty. .
inactivated on 16 Jan 1956 in Germany. .
arrived in Germany in March 1952; stationed in Schwäbisch Gmünd . relieved from attachment to the 35th FA Gp and attached to the 18th FA Gp in Sept 1954 .
arrived in Germany in 1 Sept 1951; stationed in Schwäbisch Hall . 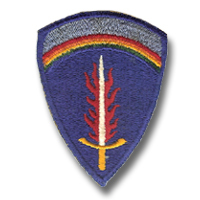 released from active Federal service on 15 Nov 1954 and personnel reassigned to newly activated 775th FA Bn . .
activated on 15 Nov 1954 at Schwäbisch Hall in Germany . returned to US (Fort Carson, CO) on ??? under Operation Gyroscope and probably replaced by the 269th FA Bn. .
arrived in Germany on ... under Op Gyropscope to probably replace the 775th FA Bn in Schwäbisch Hall. . .
inactivated on 25 June 1958 in Germany; personnel probably reassigned to newly activated 1st How Bn, 36th Arty or the newly activated 3rd How Bn, 37th Arty. .
(information will be added later) . Found something that is incorrect or missing from the above listing and graph? Have ideas on how to improve the presentation? Then please contact the webmaster! returned to US (Fort Sill, OK) in July 1956 under Operation Gyroscope and replaced by the 553rd FA Bn. .
arrived in Germany in July 1956 under Op Gyropscope to replace the 18th FA Bn in Babenhausen . inactivated on 25 June 1958 in Germany; personnel probably reassigned to newly activated 3rd How Bn, 18th Arty. 3rd How Bn, 18th FA. activated on 25 June 1958 as 3rd How Bn, 18th Arty. .
1/72 scale 280mm atomic cannon. Impressive! LANCE Missile Message Board - very interesting entries from former members of LANCE missile artillery and warhead custorida support units.